KOKOMO, Ind. – For the second consecutive year, the Western Lady Panthers have claimed the title of Queens of the County after a 44-26 win over the host Northwestern Lady Tigers in the Howard County Tournament championship clash. After the game, Western head coach Chris Keisling cited another strong defensive effort by his club. The defensive statistics show Keisling’s words were heard by his girls. In the tournament, the Lady Panther defense held its two opponents to just 17 total field goals and a .257 shooting percentage. They also forced 48 turnovers. But the second-year Panthers coach knows a team also needs to score points. After last year’s county championship, the Panthers (12-2) went on to capture sectional and regional titles before losing in the Final Four round of the Class 3A state tourney. Keisling hopes this title is a springboard for another successful run – but to do so he knows his squad needs more help from the bench. Raven Black led the champs with 12 points, Carley O’Neal added 10 and Lindley scored nine points and grabbed a game-high 12 rebounds. “Obviously, they are a pleasure to coach and it is fun to coach a group like this,” said Keisling. For the Purple Tigers (7-7), the loss ended a four-game win streak. Hannah Treadway led the team with five points. Eastern 60, Taylor 39: Class 2A No. 6 Eastern (12-2, with both losses coming to Western) got back to its winning ways as Bethany Neeley hit 9 of 12 shots to score a game-high 21 points in the Comets win. Brittany Neeley added 16 points and Taylor Holliday dropped in 15. For Taylor (4-11), Brie Boehler scored 14 points. Western 28, Eastern 21: In a low scoring clash, Western got the best of Eastern for the second time this season. Neither team could find the bucket with any regularity: Western his 12 of 44 shots and Eastern connected on just 8 of 36. 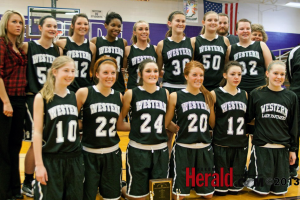 Lindley and Caitlyn O’Neal led Western with eight points while Givens grabbed 13 rebounds. Bethany Neeley led Eastern with 10 points while Holliday grabbed 10 rebounds. Northwestern 66, Taylor 34: The Lady Tigers scored the first 15 points and 20 of the first 25 as they ran away from the Lady Titans from the opening jump. Hannah Treadway led Northwestern with 14 points while Brooke Treadway added 13. Boehler led the Lady Titans with 12 points. This entry was posted in Western. Bookmark the permalink.